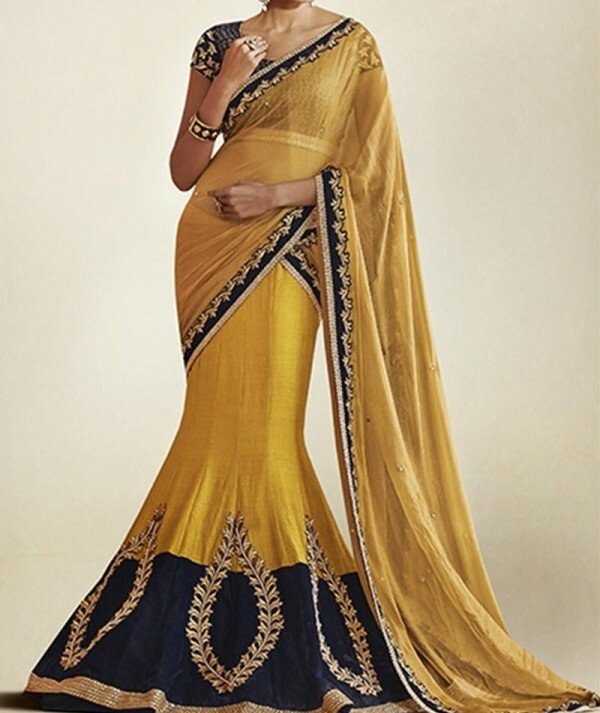 "Get This Wonderful Fish Cut Lehenga Saree In Yellow Colour To Make Yourself Look Unique At The Special Party That You Are Attending. It Has Been Well Modified With Resham Zari Work In Leaf Motifs Over The BLack Velvet Hemline. It Is Available With Matching Blouse Piece With Exclusive Art Works On It That Can Be Adapted According To Your Style And Pattern. The Blouse Size Can Be Customized Up To 40 Inches. The Blouse Shown In The Image Is For Presentation Purpose (Possibility Of Slight Colour Variation Due To Photographic Light Effect)"